Over six hundred types of dinosaurs are known and more are being identified all the time. Dinosaurs are defined as land-dwelling reptiles living in the Mesozoic era of Earth history that shared a specific anatomy. The true dinosaurs had hips, legs, and ankles structured somewhat like a bird’s, so the legs moved under the body rather than out to the side like modern lizards. 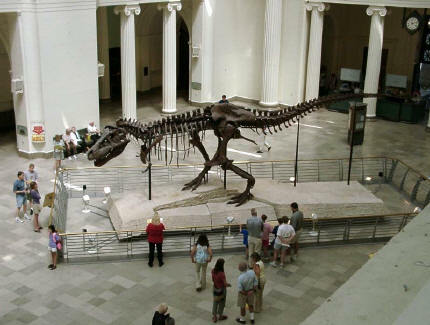 Dinosaurs differed from ancient reptiles because dinosaur skeletons were able to support large, running bodies. Prehistoric animals such as the flying Pterosaur or the swimming Plesiosaur were not dinosaurs because their body structure was very different from dinosaurs, and they did not live on land. Before the dinosaurs, another group of reptiles lived that had features in common with mammals, so they are classified with the dinosaurs. It is difficult to match specific animals to prints, but we can often determine a group of animals that possibly made the track. Dinosaurs are divided into two main groups, Saurischia and Ornithischia, according to the shape of the hip. The Saurischia are more lizard-like and include Tyrannosaurus rex and Velociraptor. They divide into a meat-eating group and a plant-eating group. The Ornithischia were more bird-like, and all plant eaters. They include Stegosaurus and Triceratops.